It’s not that I have the actual recipe, or ever did, or was even paying attention when it was being made, but guided by a bit of nostalgia — and inspired to meatloaf by a gorgeous Mexican Meatloaf recipe from fellow blogger Karen at Backroad Journal — I put together a meatloaf that is reminiscent of what my late grandmother used to make for me. Call it culinary forensics, trolling the recesses of my taste and scent memory for clues; flipping through the archives of meals at the round glass table of her dining room in urban Hato Rey; re-focusing my attention from the sounds of trucks blaring political messages from the avenue ten stories below, from the sensation of the cool tile floors under my bare toes, from the crumpled sogginess of the inevitable paper napkin, soaking up the condensation from the glass with the green and gold designs painted on it, the water flat tasting because she boiled it before drinking. When I peeled away the distractions, finished my detective work and let my inner kitchen voices have their way, this is what I came up with – something fairly juicy, with fairly typical Puerto Rican seasonings and with tomato paste incorporated two ways. The one thing I am sure of is the tomato paste on the top, like icing on the cake for the savory set. The rest is an educated guess. In fact, it probably tastes nothing like what my grandmother used to make, but it gave me that same feeling and was mighty sabroso, so I am sticking with it. As a note (and call for advice): my dad and I are currently using the Verde Farms organic ground beef from Costco. The flavor is good, but it does have a fair bit of fat and the texture is a bit more fine than we like for things like meatloaf and meatballs and burgers (it’s okay for crumbled beef dishes). 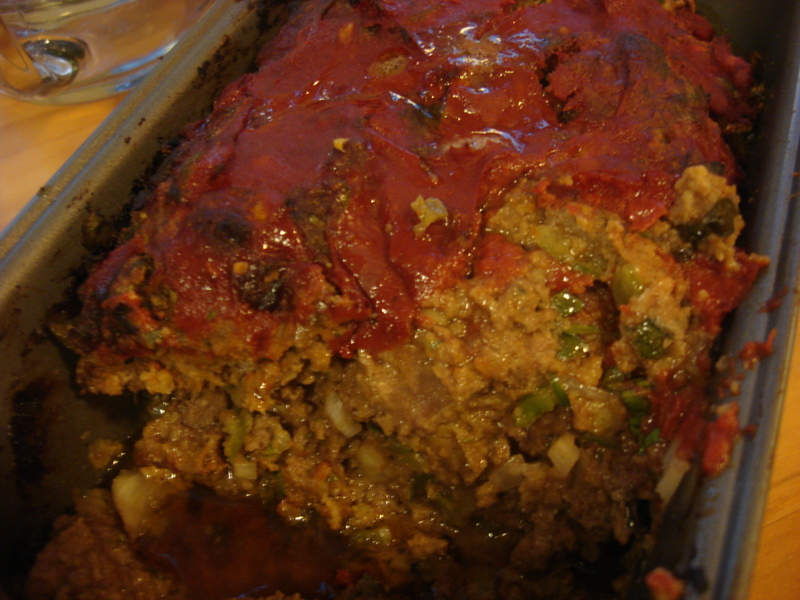 So this particular meatloaf is misshapen and reluctant to firm up and stick together for slicing purposes. It may be that I am doing something else wrong that could be corrected, so shout it out if you have an idea! The organic thing is important to me, in particular because of my son; any suggestions for a better ground beef available in Long Island would be most welcome. Preheat oven to 375°F. Add all ingredients (except additional 3 Tbs tomato paste) to large bowl. Mix all ingredients with a fork or hands just until thoroughly combined, but do not work it through or knead it, or else the meatloaf will be tough. Place in 8×5 loaf pan and bake for 40 minutes. Remove from oven and spread the reserved tomato paste evenly over the top. Return to oven and finish cooking (another 5-15 minutes – until a meat thermometer inserted in the center reads 140°F). Allow to cool slightly before serving. Just found your blog through a Versatile blogger link. 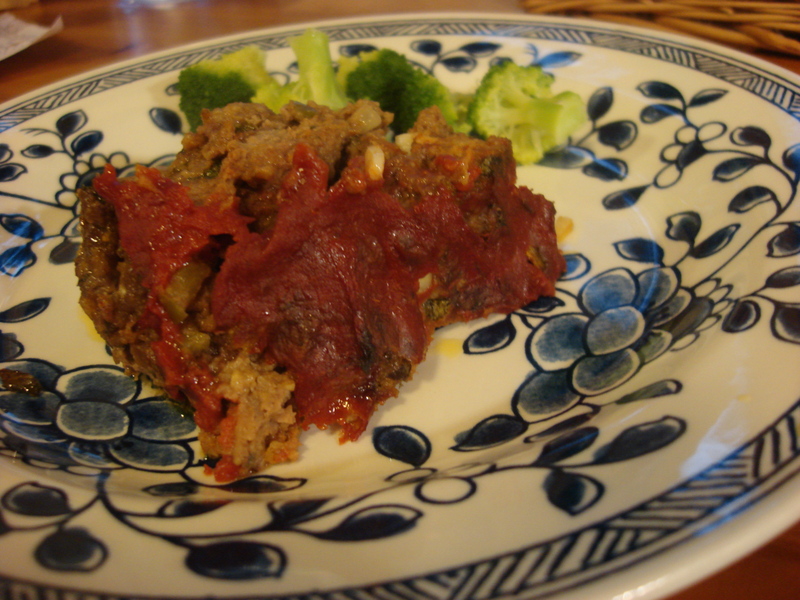 Nothing quite like a good meatloaf and I like the addition of cumin and cilantro. thanks for sharing. Thanks for visiting! I swear by cumin…. I am none too sure what the Versatile Blogger link is….I’ve heard reference to it, but am still in the dark…could you enlighten me? Thanks!!!! 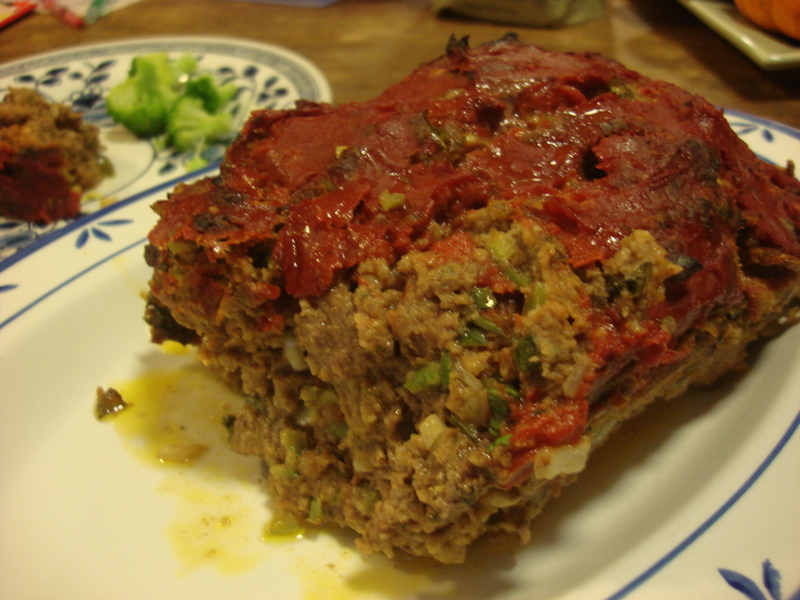 My all time favorite is meatloaf! Love how you drew on your memories to recreate this dish. Great to meet you in person at the pot luck! Great to meet you too! Hope those meetings went well! I never think to add cilantro. Great idea… now if only Katherine would eat meatloaf! Funny how many people hate meatloaf. I had a boyfriend like that once; product of a mom who hated cooking….very sad!